Doug Elliott is a HOOT! On this track, you’ll experience some of the fun, adventure and wacky science found on the album Bullfrogs on Your Mind. This extraordinary recording and will have you jumping into a frog hunting adventure deep in a southern swamp, hearing a creation myth and discovering what happens when two young fellows sneak up to a chicken roost on the night before Mother’s Day. Elliott wails away on his trusty harmonica, playing and singing a variety of old-time, folk, swing, rock, blues and one outrageous rap song! Accompanied by banjo, guitar, fiddle, trombones, bass, buckets, bells, bottles, cans, drums and rattlesnake rattles, plus dozens of animal sounds, like bird songs, gator roars, owl hoots and frog choruses. 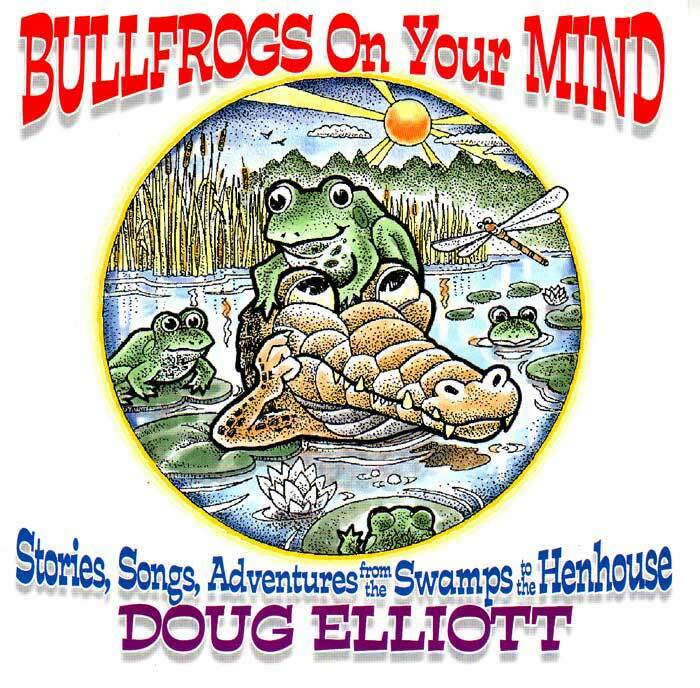 Be the first to review “Bullfrogs on Your Mind (song,Part 1)” Click here to cancel reply.